I cannot believe September has passed and were already into my favourite month of the year, OCTOBER! Dubai is still pretty hot until mid-November, however, we will be travelling back in the UK for our autumn vacation in 13 days (and counting) - Very excited to be going home for a few weeks at the best time of the year (aside from December). Honestly, I relish the idea of being cold and have fantasies of finding a gorgeous pair of winter boots and oversized jumper, drinking hot chocolate and walking in the woods with red and yellow leaves at my feet (the woes of an expat living in a hot country) haha! September was the beginning of some new personal goals and I decided to start my blog, with a quest to make a success of my passion for writing and building an online presence. My goal ever since moving overseas was to document the experience, in hindsight this was a little ambitious, as with any big life-changing decision, moving to a foreign country is consuming and you need time to adjust and slip into a routine of normality. I hope to be able to build a blog friendship group and am getting there. 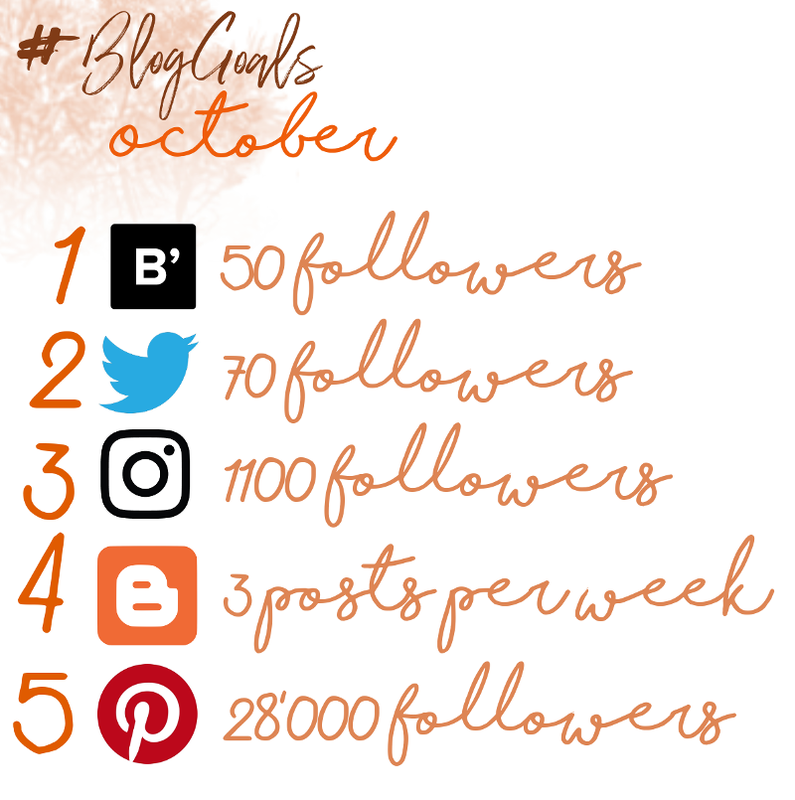 My bloglovin' count is up from 1 to 37 but my goal is to reach 50 by month end? I am an avid photographer and began my Instagram account as soon as it came on the scene but have only recently decided to set myself a goal to make my gallery a professional and match with my blog. I currently have 953 followers but am aiming to break to 1000 mark! I am currently deciding if I should start a fresh and remove my images and change to a theme style? I would love to hear from you if you took the brave decision to start again and your honesty and opinions would be amazing. I am currently posting around 2 to 3 times a week. My aim is to be consistent and upload at least 3 posts per week of fun and creative content, focusing on the key areas of my passions which are Beauty / Lifestyle and travel. I am tracking at 27,400 and have been lucky to maintain this figure for around two years. I love Pinterest and find creating new themed boards cathartic. I am currently on the blogger platform with my own domain name, however, I am really considering a moving over to Wordpress. This month I will seriously review the pro and cons of the move and decide on my blog platform future. I am constantly looking to build a lovely friendship base of fellow bloggers out there in the big bad world. I am aiming to follow and post on similar blogs to strengthen this goal. I would really like to team up with a fellow blogger to do a collab. Let me know if you would like to do one with me? I hope to gain a crowd on lovelies looking to read my posts on a regular basis and want to increase my subscribers via feedburner RSS feed. I really want to work on my photography. Living overseas is amazing and enables me to see and do so much. As mentioned above, my aim is to hone my photography skills and get a defined style to crack Instagram. Armed with my new iPhone 8 plus, I am determined to get cracking on this goal! Love to meet likeminded friends in the blogger or social media scene so please do follow and comment and I will enjoy following back.